Episode 73 - We continue with the events of the 14th day of war. You can relax because we find out that both Satyaki and Bhim made it to Arjun's side, and everyone is OK after all. Arjun finally spots Jayadratha, but he is very well protected, and the sun is about to set. It is time for one of Krishna's tricks! Following Jayadratha's "exploding head syndrome", the Kauravas are so bent out of shape that they ignore the sunset and just keep fighting. Next episode will cover the night battle of the 14th day. Thanks for all your nice comments. I love to hear from you! 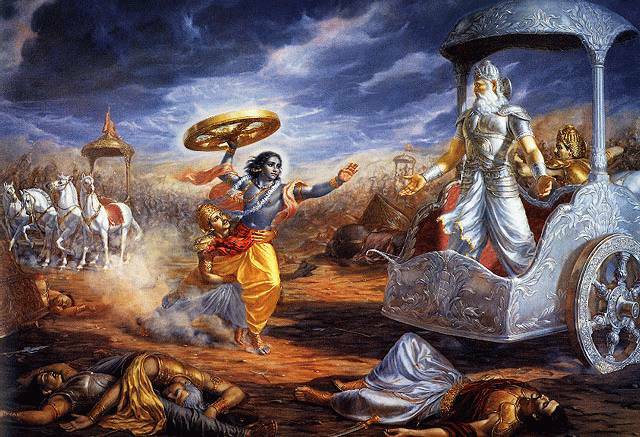 If you haven't already, please visit my blog at mahabharatapodcast.com and leave a message.